Moving to US was a change in terms of diet, along with many other things. But the good thing is that every item is labeled with its name and also providing some information for newbies like me. Most vegetables have an American English name, like Bhindi is called Okra here, unlike its British name Lady's finger. There are many things which were new to me.. the variety of apples - Granny Smith, Honey Crisp, Gala, Red, Fuji and every season I am introduced to some new kind. Even potatoes are of many kinds. Most Indian vegetables are available in the local Indian stores. But I prefer using local seasonal produce. Over last few years, we have found ourselves some favorites - Collard Greens, Butternut Squash, Acorn Squash, Zucchini Squash, Frozen Lima Beans. These blend very well with the Indian way of cooking and are part of our everyday meals. All these vegetables are indigenous to US and I have no idea of their Indian names. We Konkanis love to have a veggie roll called as Pathrado/ Aluwadi. Some might know it as Gujarati Patra, made of Colocasia/Arum/Taro Root leaves. I haven't found this leafy vegetable till date in our local Indian store. But nowadays, we enjoy Patrado made of local Collard Greens. It tastes similar to Cabbage which we call as Pata Gobi in Hindi and Kobi in Marathi and Konkani. These are available year-round and the leaves are big enough for our desi rolls. Butternut Squash tastes similar to a pumpkin which we know as kaddoo in Hindi, lal bhopla in Marathi and dudhi in Konkani. This squash stays fresh for weeks at room temperature. I use it very often in our Indian meals as I use pumpkin - stir fry Squash Bhaji, coconut curry Konkani Khatkhate, steamed Dudhi (Pumpkin) Idli and fried pumpkin bread called as Gharge (Pumpkin Puri) in Marathi. Acorn Squash, also known as Winter squash, tastes similar to pumpkin, but I use butternut squash more often as compared to acorn. I use both acorn and butternut for the above mentioned recipes. Zucchini, a green summer squash tastes best when grilled or stir fried with little oil and few spices. I use variety of seasonings for this vegetable, sometimes Cajun seasoning, sometimes Garam Masala, sometimes Kabab Masala and so on. But our favorite is Shallow Fried Zucchini with a crisp semolina/rava crust. You can cook Yellow squash in a similar way. Baby Lima Beans is another vegetable liked by my family. It tastes similar to green Peas which we call as Matar in Hindi and Marathi. More often, I prepare a Konkani style Coconut Curry with these green colored beans. Other than that, I use it for mixed vegetable curries like Veg Kurma, Navratan Korma and sometimes Lima Beans Pulav, same as I would cook Matar (Green Peas) Pulav. Thanks a million for the information and tips. 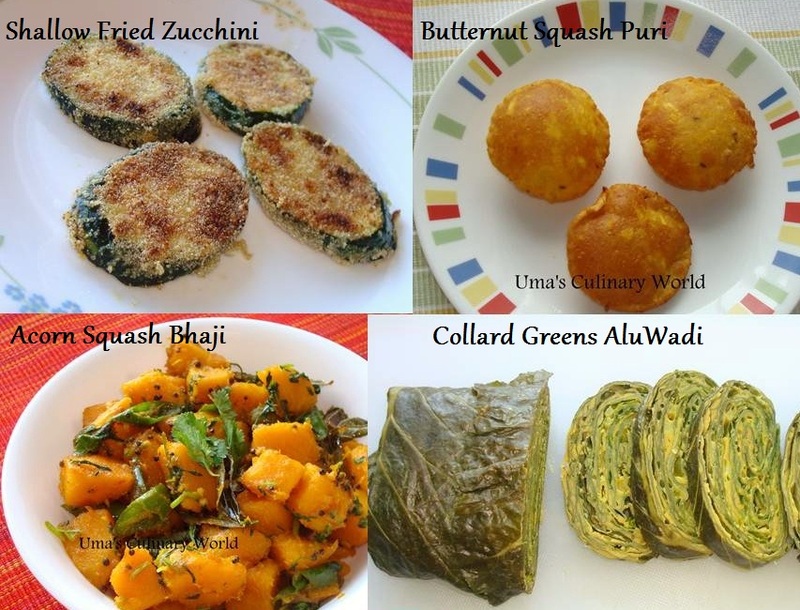 I have recently joined my husband in the US and as he is a Konkani, I'm sure I'll use a lot of your Konkani and Maharashtrian recipes using seasonal US produce. Thats really nice info over there. Please update with some more if you know now.